Knights: The Blood of Kings is now published in ebook form on Amazon. It will soon be available at Apple, Barnes and Noble, Kobo, and other places--including print and audio formats. Is this exciting? Certainly! The book turned out to be longer than I had anticipated, hence the delays. But in my opinion it was well worth the extra time spent on it. So what next? Current plans involve another book based on the Knights Series but set in our time. Also, I am beginning a new series called Knights of Ollanhar. This series will involve some of the characters from the first Knights Series. I am also still working on The Beast Below and should publish it sometime in the near future. Knights: The Blood of Kings is drawing closer to completion. This will be the 4th book in the Knights Series. I've also made significant progress on The Beast Below (book 1.5). Fans of The Curse of Credesar may be wondering if I ever plan to continue that series. The answer is yes! I do have The Curse of Credesar, Part III in the works. Right now at least five volumes are planned for this serialized tale that is actually a continuation of the Knights Series. Two new books in the Knights Series are scheduled for publication this fall, possibly in time for the holidays. They are Knights: The Blood of Kings (book 4 of the series) and Knights: The Beast Below (book 1.5 of the series). The Beast Below takes place earlier in the series, but reveals many new things about Lannon, his abilities, and his world and is linked to The Blood of Kings. How can a book set earlier in the series reveal many new things? To avoid spoilers, I can only say that it does, and in a very epic way. The cover art for The Beast Below is now finished and can be viewed here. 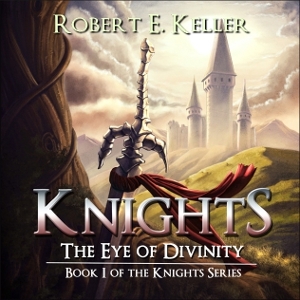 The audio version of Knights: The Eye of Divinity is now on sale. It turned out excellent and provides a new way to enjoy the book. The rest of the series will soon be available in audio format as well. I am currently working on two new books in the series and making good progress. Audio production for "Knights: The Eye of Divinity" should be completed soon. My next post on the topic will be a link to the finished product. Next up: the long-awaited print version. I'm currently working on "Knights: The Beast Below" (which will likely feature cover art that hasn't been revealed yet) and "Knights: The Blood of Kings" at the same time. Since the two books are linked by certain events, it's actually helpful to transition back and forth between them. I expect "The Beast Below" to be finished first. In other news, my books experienced a nice surge in popularity in the UK and Ireland thanks to "The Curse of Credesar" being chosen by Apple for their recent Breakout Books promotion. Although the promotion has ended, the benefits have continued. The cover art for "Knights: The Blood of Kings" is complete. This is book 4 of the Knights Series and the first book of the second trilogy. You can view the cover art here. The next book scheduled to be published in the Knights Series is actually a shorter novel that takes place just after "Eye of Divinity" and before "Hand of Tharnin." It is called "The Beast Below" and clears up a few mysteries left from the first book. So it's actually a sort of companion novel to the "Eye of Divinity" or an extension of that first book. The characters are younger, but new abilities will be revealed as well as new elements of the Dark Watchmen and the Deep Shadow that will set the stage for future books. However, I am also currently at work on the first book of the second Knights trilogy, called "The Blood of Kings" and which takes place soon after "Heart of Shadows." Thus, "The Beast Below" is merely a side project, but one that readers might find a worthy addition to the series. By now I should have answered all the questions from my fan mail. If I missed responding to anyone, it was unintentional and you might want to check your spam folder or send again. Sometimes there can be quite a delay before I'm able to respond, but for now, at least, my goal is always to send a response. The audio version for "Knights: The Eye of Divinity" is in production. I'll post more information on this later. I should also be posting news of a print version in the near future. I'm pleased to announce that the next book in the Knights Series has arrived. "Knights: The Heart of Shadows" is now available on Amazon, and should be available in the other stores in the near future (pending shipment). Click on the cover for purchase information. You can find more information concerning this promotion at the Smashwords blog, found here. I've extended the length of Knights: The Heart of Shadows a bit, but I'm hoping to have the book published by the end of this month, depending on how long the editing takes. 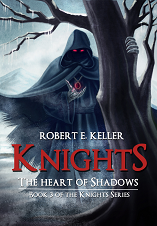 I'm now looking at a possible February 2013 release date for Knights: The Heart of Shadows (book 3 of the Knights Series). This takes into account any minor, unforeseen delays that might turn up. So keep watch for an update sometime next month. Knights Series Update: "Knights: The Heart of Shadows" (Book 3 of the Knights Series) should be available for purchase sometime in January, barring any unforeseen delays. I also have plans to publish a novella called "The Beast Below: A Knights Tale" which takes place between "The Eye of Divinity" and the "The Hand of Tharnin" and features some important happenings to the series. No idea yet when the novella will be ready to publish. 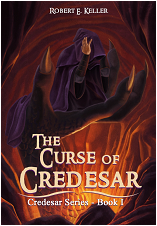 Also, I split "The Curse of Credesar" into two books, Parts 1 and 2. I plan to offer Part 1 of the ebook for free in all the stores but will probably leave Part 2 at the low price of $2.99. (Note: No new writing has been added to either part.). For those of you wanting new writing in the series, I will have news on "The War of Credesar" (Book 2 of the Credesar Series) in the near future. As the Credesar Series progresses, it shall be tied in more deeply with the Knights Series. It is not, however, a direct sequel to the Knights Series and either series could be read first without anything being spoiled. I am having some minor adjustments made to the editing of "The Curse of Credesar" (both parts) for the sake of quality. These are very minor edits (such as correcting a few typos, trimming down a few bloated paragraphs, and adding a few missing words) and the story will remain completely unchanged. One more note that might be of interest to some of you. I have another series in the works called "A Knight of Tharnin" which is set in our time. Book 1 of that series is nearly complete, and could possibly be published in late December or early January. So keep watch for that. The cover art for Knights: The Heart of Shadows (Book 3 of the Knights Series) is complete. You can view it on this page. I am making steady progress on the book itself and it should be published by Christmas or shortly thereafter. I am pleased to announce that Knights: The Heart of Shadows (Book 3 of the Knights Series) is in progress. I should have some cover art to reveal in the near future. My epic fantasy novel ﻿Knights: The Hand of Tharnin﻿ is now available for sale on Amazon, for the Kindle. It will also soon be available through other outlets as well. This is book 2 of the Knights Series. I was recently interviewed by a fellow writer, A.J Cooper. Read the interview here. There has been a slight delay in the release of Knights: The Hand of Tharnin. However, progress has resumed again and I'm anticipating that it will be up for sale within a week. Yet another cover update. I have just received the finished cover art for the first volume of a new fantasy series of mine called A Knight of Tharnin that will span 2 books. The book itself should be available for purchase shortly after Knights 2 goes up for sale in the near future. You can view the cover on this page. The excellent cover for Knights: The Hand of Tharninis complete. Knights: The Hand of Tharnin (Book 2 of the Knights Series) is rapidly approaching the final edit stage. My cover artist should have the artwork ready in the near future, as I've already received the sketch. I never like to give a release date, in case there is a delay, but I'm very focused on getting this project listed for sale. The final, final edit is always done by me, after members of my team have gone over it, and I'm happy to say, I enjoy editing my work. This is when I get a chance to add in some of the little details that I hope will make the book really stand out. The cover art for Knights: The Hand of Tharnin is now in progress. The book itself is meeting my expectations in all ways. I expect Knights 2 to be longer than the first novel. As to when it will be published, I can't give an exact date. But I can say I'm making progress on it every day and would like to see it available for purchase sometime this winter.